Don’t be afraid to tell staff if you want to see and hold your baby. You may be able to bath and dress your baby, take your baby for a walk or even take your baby home for a period of time. You may want to change your baby’s nappy or wrap your baby in a blanket. Don’t be afraid to do things that you would do for a living baby. You can spend as much time with your baby as you want. It is often helpful for your other children to meet their brother or sister and have the chance to say hello. You may wish to invite close relatives and friends to the hospital so that they, too, can meet your baby. This may help them to support you in your grief. You may also need to have time without your baby. Ask the staff to care for your baby when you are ready for a break. Red Nose Grief and Loss has a program called “The Treasured Babies’ Program”. The Treasured Babies’ Program began with the aim of supporting bereaved parents while they are still in hospital with their baby (or babies in the case of a multiple birth). The Treasured Babies’ gifts are supplied to hospitals to give parents something special in which to dress their precious baby. Outfits have been designed and developed with input from midwives, social workers and bereaved parents for families who experience the loss of their baby prior to full term. Some of the garments open out flat for babies who might be quite fragile, to ensure they are able to be dressed with a minimum of handling. We work together with participating maternity hospitals to provide a range of support materials that are immediately available when a baby dies. The Treasured Babies’ Program seeks to make sure that all parents receive the best possible grief support. The Treasured Babies’ Program aims to help hospital staff support families by having gestation-appropriate Treasured Babies’ gifts on hand to give to newly bereaved parents. These gifts contain beautiful handmade clothing that has been specially designed, relevant literature and a naming certificate. The Treasured Babies’ Program also supplies Angel boxes for burial, Memory boxes in which to keep precious items and Remembrance boxes for early losses. Dressing their deceased baby can help to ‘normalise’ the bereaved parents’ experience. Parents are more inclined to spend time with their baby when he/she is dressed. The clothes give them silent permission to be a mum and dad. Spending quality time with their baby helps parents to come to terms with their grief in the coming months and gives them some precious memories to treasure. Simple actions, such as bathing, dressing and taking photos of their baby, are very important to the grieving process. Photos taken become cherished because this is their only opportunity to do this. Having tangible memories will help parents to grieve and they will be able to share these with their support networks. The literature included in the Treasured Babies’ gifts answers many of the immediate questions that parents have with regard to their newly born child. It also lets them know of the support organisations available within the community that they can access, particularly once they have left the care of the hospital. 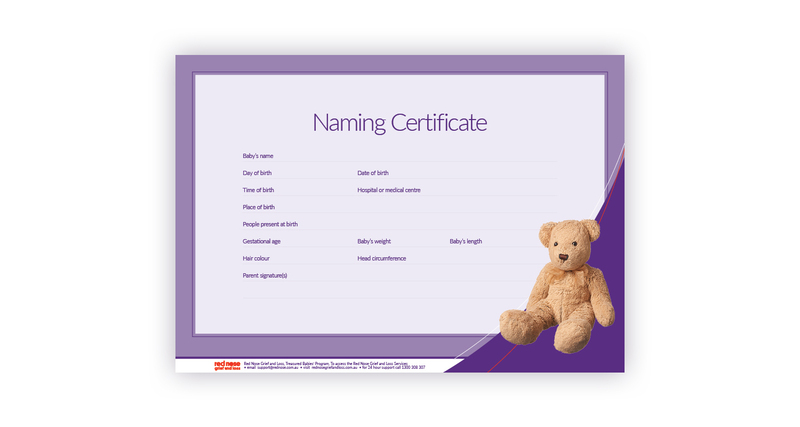 The Naming Certificates are a very important way of acknowledging babies under 20 weeks’ gestation, as these babies do not receive a Birth Certificate. Hospitals and parents receive the Treasured Babies’ gifts free of charge. The Treasured Babies’ Program is fully funded by donations and sponsorship and the committee coordinates a network of volunteers who hand make the precious gifts/ All materials used have been kindly donated by businesses and individuals. Why is the Treasured Babies’ Program so important? When a baby dies there is often little warning, leaving parents in shock and unable to organise clothing and other items for their baby. Having ready access to appropriately-sized baby clothing, supplied by the Treasured Babies’ Program, can reduce some of the stress for parents at a time that is already very difficult. They are then able to spend as many cherished moments with their baby as possible. A range of items has been developed so that the gift can be adapted to meet different situations including: miscarriage, stillbirth, premature live birth/subsequent death, neonatal death and multiple births (of each of these). Parents may want to dress their baby in one outfit for photos and change their baby into another outfit for burial. This way they can treasure the clothes that were actually worn by their child. Additional clothing from the Treasured Babies’ gift range is made available to parents. Being able to give newly bereaved parents the opportunity to choose what their baby wears can be empowering to the parents at a time when they have very little control over their situation. For further information about the Treasured Babies’ Program and how you may receive these gifts please contact Red Nose Grief and Loss Services on 1300 308 307. 1. Ford, D., Richardson, R., Robertson, S-E., Stammers, R., Oxlade, E., Carter, J. & SIDS and Kids. (2016). Stillbirth and Neonatal death: A Booklet By and for Parents whose Baby is Stillborn or Dies soon after Birth. Malvern, Vic. : SIDS and Kids. (Original work published 2004 entitled Treasured Babies).